The sauna is opening up next to the maid cafe, and its owner is a real treat! But everything is not as it seems! Is Felicia too good to be true? Has the balance been skewed at the Poke-Con? Will Carmen FINALLY inhale her top? 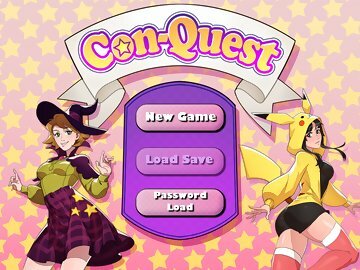 Unravel the mystery in the latest update to Con-Quest! A few of our Patrons made a fan guide for the game! Check it out here! https://docs.google.com/document/d/1iq3g7QRlfV2DqwWEiWusvPqITWw6g4lqUA1Jr7F1xOo/edit?usp=sharing ----------------------------------------------------------------------------------------- Thanks again to our Patrons and the Newgrounds Community for allowing us to bring you another update to Con-Quest! Your support means the world to us! ----------------------------------------------------------------------------------------- HEY! We now have a Public Discord Server! Come on in and say hi!https://discordapp.com/invite/Upr9Njg ----------------------------------------------------------------------------------------- Don't forget to check out our Patreon! Patrons are able to vote on upcoming creative choices, submit suggestions and improvements directly the developers, and receive new versions of the game early with EXP and Currency bonuses and without bra versions of certain character portraits! https://www.patreon.com/cuddlepitgames Art by Emily. Check her out athttp://puddingpack.deviantart.com/ Stickers and a few cosplayers by GrossGirl. Check her out athttp://grossgirl.newgrounds.com/ Ivy Sticker set by Chicken! Check her out her style is awesome!http://rottenchicken.tumblr.com/ Chief music by EternalSushihttps://www.youtube.com/watch?v=6lAIQu_1YVU ----------------------------------------------------------------------- Patch notes: Weakness damage has changed for the opponent characters. You should notice higher numbers. Flareon cosplayer has been added, along with her quest line, reward images both static and animated! A 3 part CG has been added during the Flareon quest line with and extra CGs 2 at the end. Carmen's emotes have been added. The way reward images are viewed has been totally re-done. There is a now a menu that can be open and closed that will make it easy to switch between images. Mia and Nia now have static images and an extra set has been added with Mia on the bottom. Jess will now appear without bra in her animated reward. CG's will now appear under the"special" option in the new reward menu. For example, the"tower of femmes" CG can be viewed in Jacylns reward menu. --------------- Bug Fixes Fixed a bug that caused players to get stuck on ivy's quest. Fixed a bug that caused the Patreon menu to get stuck open.